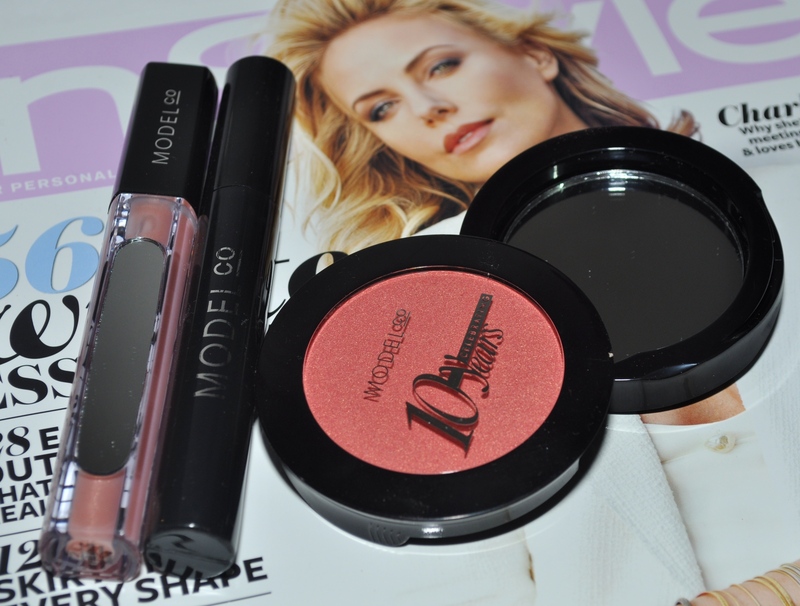 The July issue of Instyle (the one with Charlize Theron looking amazing on the front) comes with 2 different trio’s of Modelco products to celebrate Modelco’s 10th birthday. The lure of the beauty product was too much so I decided to get an issue which came with the Peach Bellini trio. I can’t remember what the other set was called but the shades in that set were more mauve toned. They looked nice as well but I really liked the warm coral glow of the Peach Bellini set. Each trio contains a blush, lip gloss and mascara. I love the blush pot packaging which comes with giant swivel out mirror. It reminds me a lot of the Smashbox packaging which has the same swivel out mirror. The blush shade is ‘Peach Bellini’ and is a really pretty coral with a gold sheen through it. It isn’t the most pigmented blush but it applies better on the cheeks than it does when swatched. 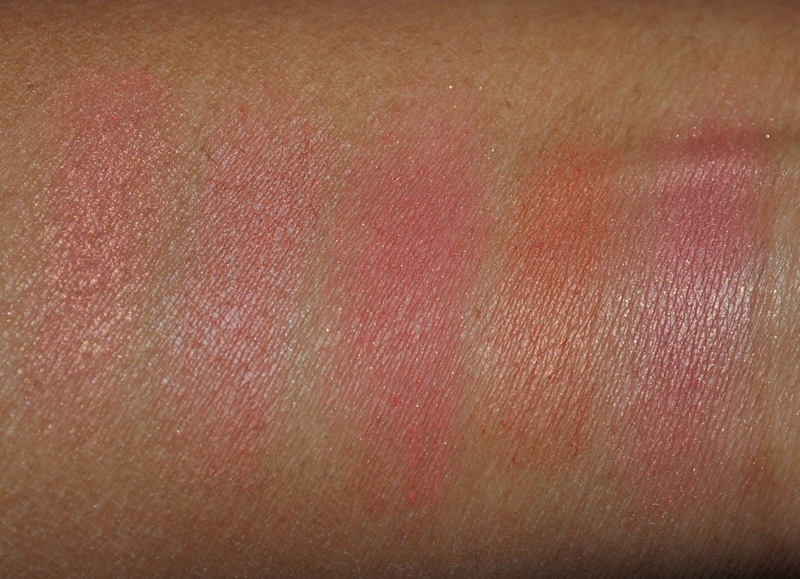 I swatched it with some other blushes in my collection to show how it compares. I couldn’t figure out what the included mascara is called as there’s no writing on the tube. I tried going through the Modelco website but still couldn’t work it out. 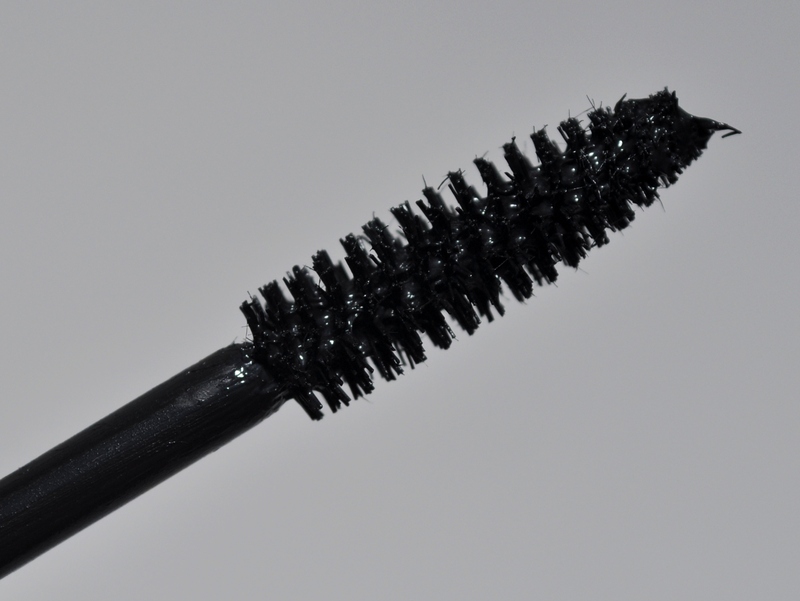 The mascara has a really standard looking brush and, to my eye at least, it seems like the product could have some fibres or something mixed in it. Take a look at the picture below and you can see what I mean with all the tiny little fibre looking things all over the brush. I know that Modelco are known for their fibre inclusive mascara’s so I wouldn’t be suprised if this is one of those formulations. I used this the other day when doing my makeup and, while I thought it was ok, I don’t think I’d repurchase it (not that I could anyway since I have no idea what it’s called!). I’m not a big fan of fibre mascara’s as I don’t particularly need length or volume from a mascara and because I don’t like the way a lot of them dry. The main thing I look for is something that is really dark, that gives me a natural lift and that doesn’t clump. Here’s my EOTD from yesterday with this mascara. Unfortunately I didn’t get a chance to take this shot till I came home so my eyeshadow has creased! 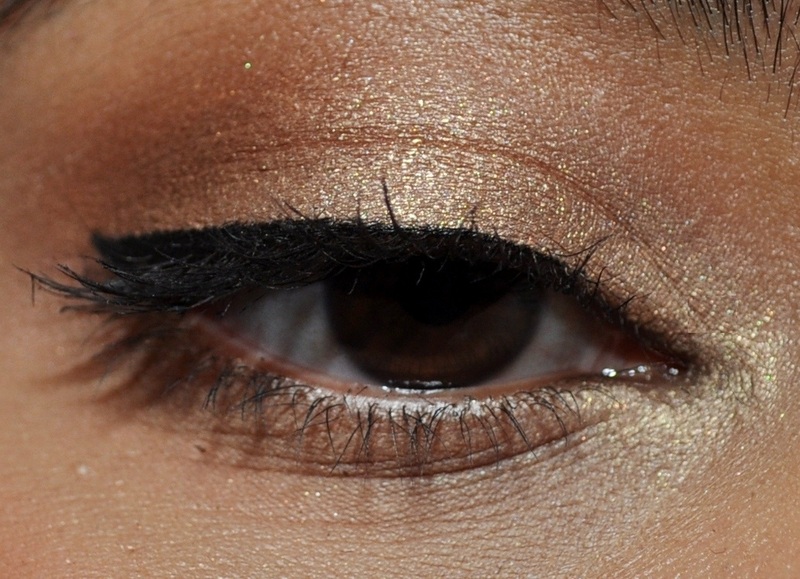 It’s just a really simple combo of MAC Flip on the lid, MAC Cork and Orange eyeshadow in the crease and MAC Solar White around the inner corner. 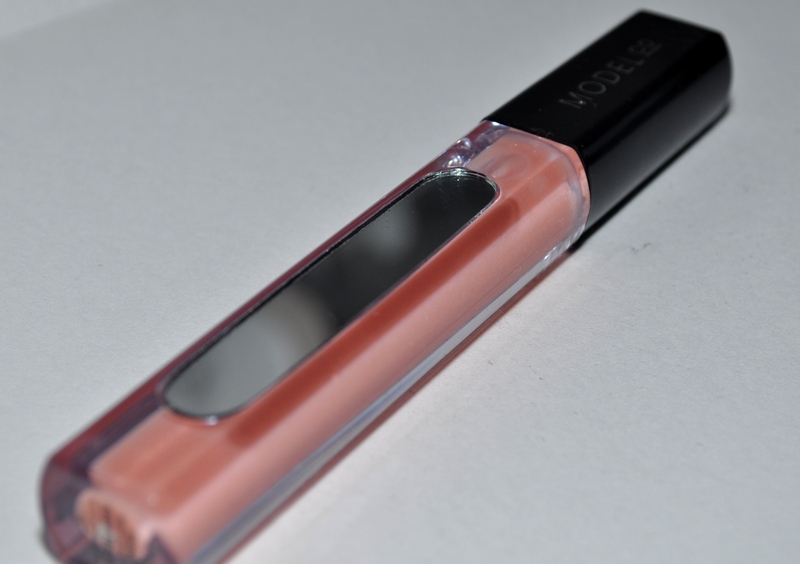 The included lip gloss is in the shade Strip Tease and comes with a mirror included on the tube which I love! 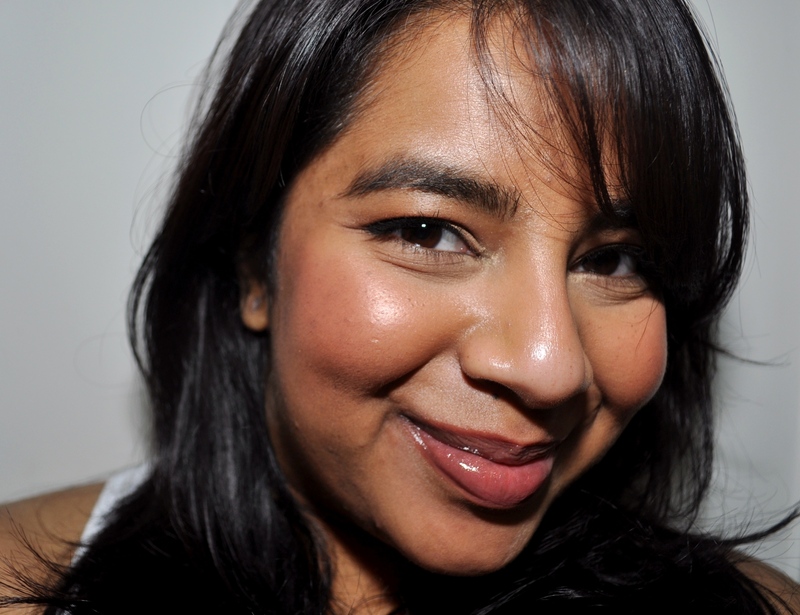 The shade is a really sheer translucent peach that doesn’t translate to the lips and really just gives my lips shine. I like the formulation though because it’s not sticky and it has a really lovely fruity smell to it. I usually don’t like strong scents in lip products but this one is nice. 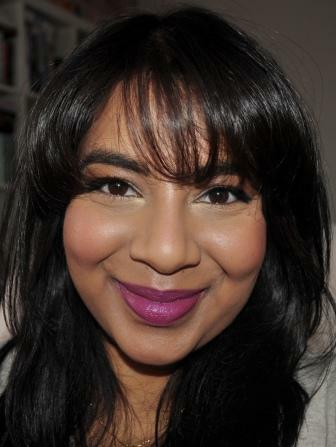 I used all three products when doing my FOTD yesterday and I think the blush is definitely my favourite of the 3 items. I thought this was a great magazine freebie but I don’t think I’d repurchase any of these items. The gloss, while nice, is nothing spectacular enough that I’d want to repurchase and any beauty junkie’s like me would already have another 10 dupes of it in their collection. The mascara again wasn’t my favourite formulation. I would have considered repurchasing the blush as I do love the colour but I already own way too many blushes to last me a lifetime and don’t think I’d actually ever hit pan on this shade. This trio of products is apparently valued at $92 but I find that really hard to believe! The lipgloss is $18 AUD, their mascara’s seem to be in the $30 range and, while the blush isn’t even on the site at all, I highly doubt that it’s worth $44! If this set is actually worth $92 then I would argue that it’s over priced as I can easily get higher end products in a similar price range. Instyle is usually $8.20 but this particular issue was bumped up to $12.95. I actually didn’t notice the price difference until later as I tend to just put things in my shopping cart and not really notice the price. While I don’t think the set is worth $92, I think it’s definitely worth the extra $5 for the magazine especially if you’re trying to build your makeup collection.